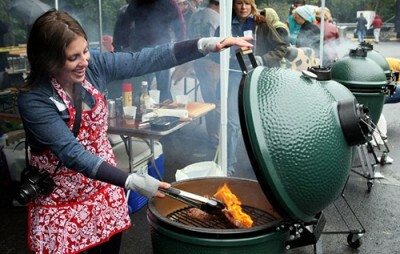 May is National Barbecue Month, and of course that’s our favorite time of the year at Big Green Egg!Of course, with the versatility of the EGG, you can Grill, Roastand Bake… but cooking for longer periods of time over low heat infused with wood smoke is what Smoking– and what some call “real barbecue” – is all about. It is commonly believed that the term ‘barbecue’ originated when Spanish explorers landed in the Caribbean and experienced the slow-cooking of meat over an indirect fire. They referred to this method of cooking as barbacoa, and as they ventured farther north, they took this cooking method with them. Techniques and taste evolved regionally throughout the years, creating the traditions that we know and love today. Where can I find the best barbecue? That depends on who you ask. Across the U.S., there are distinct barbecue regions that each have their own style that BBQ enthusiasts defend with fierce loyalty. Differing in meat and sauce, the “BBQ regions” include the Carolinas, Memphis, Kansas and Texas. South Carolina loves pulled pork served with a mustard-based BBQ sauce, whereas North Carolina tends to use a vinegar-based sauce on their pulled pork. A thick, sweet molasses and tomato sauce is a Kansas City original, and often enjoyed with the popular burnt ends dish. Beef is king in Texas, and Texans tend to prefer day seasoning on the meat with very little sauce. With an EGG, it really doesn’t matter if you are barbecuing Dr. BBQ’s Smoked Flat-Cut Brisket with Coffee, Barbecue Chicken with Alabama White Sauce or Curtis Stone’s Baby Back Ribs with Apple-Bourbon Barbecue Sauce, because your barbecue will always end up perfectly cooked and delicious … and that’s something that we can all agree on! Cooking “low and slow” breaks down the connective tissue in meat and tenderizes tough cuts of meat like beef brisket, pork shoulder and spare ribs. The insulating ceramics of the EGG allow for precise temperature control even at low heat, and for added convenience, the EGG can handle those long cooks – sixteen to eighteen hours or more – without having to add more charcoal or constantly check the heat! Providing a subtle ingredient to your favorite recipes, aromatic wood smoke delicately seasons food as it cooks. Chips are ideal for quick bursts of smoke, while chunks are larger pieces of hardwood better suited for creating more smoke over a longer period of time. Big Green Egg’s 100% natural apple, pecan, cherry, hickory and mesquite smoking woods are well-known favorites of famous pitmasters and backyard chefs alike, and because each wood imparts different flavoring to food, the combinations are endless.